There’s always been a fine line between homage and rip-off in gaming. Any sufficiently innovative game that finds mainstream success is guaranteed to be followed by waves of re-imaginings and imitations. You can see recent examples of this in Souls-likes and the battle royale craze — heck, even first-person shooters used to be known as “Doom clones.” When Left 4 Dead came out in 2008, it launched a sub-genre of cooperative first-person shooters that’s still going strong today. Earthfall, recently released by Holospark, follows Left 4 Dead’s example so closely that it gets lost in its shadow. It swaps a zombie outbreak for an alien invasion, adds some light building mechanics, and, regrettably, strips the game of nearly all of its charm. 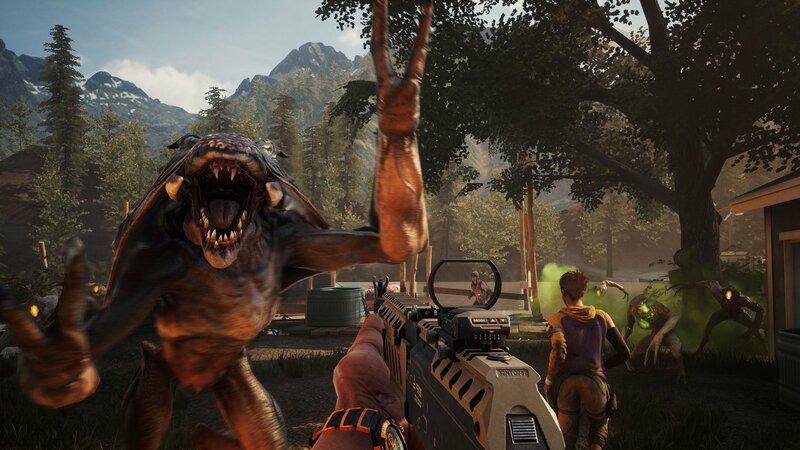 If you’ve played any co-op FPS before, there’s little to explain about Earthfall. You team up with three other players and/or bots to outrun an alien swarm, stocking up on weapons and gear at safehouses along the way. Throughout each level, you’re tasked with small objectives such as powering up generators, cracking doors with thermite, or destroying alien hives, which inevitably call down a horde of baddies on your position. In practice, these objectives feel like mere time-fillers. You repeat the same few basic actions throughout each level, with only the slightest justification of why you need to turn crank A or push button B, or why doing so attracts the attention of every alien for miles. The goal is always to survive and escape; the swarm is infinite, and hunkering down anywhere for too long will eventually get you killed. It’s unfortunate that Earthfall does so little to differentiate it from the genre’s progenitors, because it comes up wanting in nearly every comparison. I can still remember exhilarating moments from the Left 4 Dead games: holding off against hordes of zombies while waiting for a bridge to lower or running desperately through a hospital teeming with blood-frenzied undead. Those memories are a decade old now; I played Earthfall this morning and I’m struggling to recall anything half as dramatic. That being said, it does have some fun set pieces. Taking hold of an alien weapon to blast away at the hordes, jumping in and out of the windows of a church to avoid being outflanked, mounting a machine gun to hold out against a swarm while you wait for evac by air — these are (relatively) exciting, well constructed moments, but they get lost in the tangle of warehouses and train yards packed with the same half a dozen enemies. Levels in general are claustrophobic and directionless, feeling more like purpose-built mazes than the ruins of a conquered civilization. There is some attempt at environmental storytelling, with friendly (but always abandoned) campsites and weapon caches strewn along the landscape, but most stages are practically identical and none of them do much to set a tone. It makes sense that a town overrun by alien invaders would feel desolate, but I never got the sense that any of the environments were ever anything aside from shooting galleries. It doesn’t help that your reasons for exploring any particular area are never made clear. Characters will occasionally remind you that Jacob sent them this way, or that you need to team up with Grace, or that Griggs needs help, but you never learn who any of these people are or develop any relationship to them. Some of this is expanded on in lore text that you can read from the game’s menu, but nothing in the game made me even the tiniest bit curious about its backstory. Your characters themselves are pretty much blank slates. You can play as either Maya, Danny, Jonas, or Roy. And that’s all I know about them. This type of game admittedly doesn’t need any kind of deep characterization, but a little personality would go a long way toward making you care about them. When I revive Maya or shove an attacker off Jonas, I don’t get the slightest sense of having helped out someone I care about; it’s the equivalent of unjamming a gun. The only character that elicited any reaction from me was Danny, and I wish he hadn’t. Every character has a few voice lines they shout when they heal, see an enemy, get hurt, and so on. Danny is an Asian-American man and almost all of his lines revolve around meditation, faux-Buddhist musings on the unity of life, and in one case chakras, because if that’s the level of stereotype you’re working with, treating the entire continent of Asia as one culture isn’t much of a stretch. And if that wasn’t quite enough to let you know that Danny is nothing but an ambulatory list of cliches, there’s a section of the game where he repeatedly yells “Wax on, wax off” as he destroys alien cocoons. It’s baffling to see a game that puts so little effort into characterization still manage to screw it up so badly. When they’re not reciting lines like racist cartoon characters, your crew will mostly be mowing down aliens by the hundreds. Needless to say, a first-person shooter hinges on how good its weapons feel to use, and here Earthfall is entirely mediocre. Its gunplay doesn’t strike me as the worst I’ve ever seen, but firing a weapon in this game is about as impactful as it is in laser tag. You’ll find a variety of pistols, shotguns, SMGs, and assault rifles scattered around each map, but none of them feel particularly good to use. Even using a rare minigun or flamethrower, you never feel like you’re handling something powerful. You just point at enemies, they shoot geysers of brown goo into the air, then they fall over. And I want to emphasize the falling over part. Enemy animations are so stiff and unnatural that it’s often hard to tell when you’ve even finished one off. Even when you shoot off a creature’s limbs or knock its head off, its body will just tip over like an unbalanced mannequin. You can also find a few melee weapons, but the game seems aware of how underwhelming they are, judging by their awkward animations and relative scarcity. The main effect that they had was reminding me how much better melee worked in Vermintide. The standard enemies that fill each stage come in two varieties: brown melee aliens and green ranged aliens. There are a couple different models, but in a firefight all you’re seeing are lumps of dull colors. You’ll also face off against special infected — I mean, special aliens — that show up more intermittently. They announce themselves with an indistinct growl before pouncing, but from that point on they seem to be completely silent. I could never tell where one of them was coming from, usually only finding out their position when either I or one of my teammates got pounced on. These enemies are all pretty standard for Left 4 Dead-inspired shooters. The Whiplash drags characters away from the group (by chomping on their head and carrying them around, which made me laugh out loud every time it happened), the Thresher pins characters down, the Sapper explodes and spreads toxic gas, and the Beast is, naturally, a big alien gorilla that shoots red lightning. You can deal with any of them using the same strategy of shooting them repeatedly until they fall over. The best special enemy is the Blackout, a flying squid monster that shields itself and shoots lighting (blue this time!) at your party. What makes it interesting is that it can fling itself around imperceptibly fast, leaving a glowing blue trail to its destination and blinding anyone caught in its path. It’s not much, but you take your fun where you can get it in Earthfall. The one interesting thing Earthfall brings to the table is its fortification mechanic. You’ll come across relatively safe spots stocked with weapons, ammo, and other gear throughout your travels, but activating their item dispensers usually involves calling a horde of enemies. To survive this, you can set up barricades and turrets that are scattered around the area. At its most basic, it’s an interesting idea, but it falls flat in practice. Whenever you need to set up one of these outposts, you’ll generally find the exact number of barricades you need to seal off the exits and usually a turret or two. The only difference in gameplay between setting these up yourself and simply finding an area with defenses already in place is that it takes a few seconds to put everything in place. I hope Holospark expands on this idea later, as it has the potential to make Earthfall into something more than a slightly different flavor of Left 4 Dead. On the technical side, Earthfall works without a hitch. I didn’t have any performance issues and never dropped a connection, which is no small feat for an online game on its first weekend. While you can’t see anyone’s ping, I never noticed lag from my co-op partners and, thanks to the drop-in multiplayer, I usually had at least two other players take over for bots by the end of a level. That being said, I only ever saw 300-400 players online at a time while I was playing, and Steam Charts lists the max player count at 577 as of this writing, which doesn’t inspire a lot of confidence in Earthfall’s longevity. The developers already have a framework for adding cosmetic items, and the end of the game’s roughly four-hour campaign hints at more content to come, but it’s hard to see Earthfall drawing much of a crowd without some major improvements to a lot of its core aspects. More than anything, Earthfall made me wish I were playing one of the many better versions of its formula that already exist. Earthfall is a cooperative FPS with a few interesting ideas that it fails to deliver on. Built on a poor foundation of unsatisfying combat and repetitive mission structure, every aspect of the game is mediocre at best. With some serious retooling, its light building mechanic could be an interesting twist, but there’s little reason to play Earthfall in its current state with so many better examples of the genre already out there.